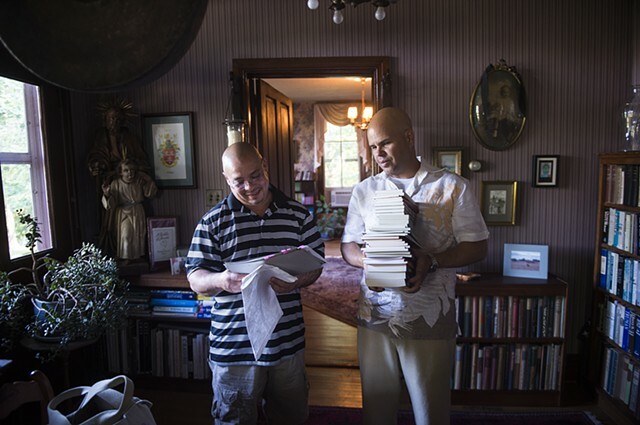 Correa shares a moment reminiscing about art he made while in South Woods State Prison in New Jersey with Robert Sowers, a volunteer for Triple Gem, on Aug. 29, 2015 after a memorial service for friend and former inmate Earl Olsack, who died while serving time at South Woods. Mulligan and Sowers both have met plenty of prisoners while volunteering for the non-profit who have none or little family outside prison. Olsack was one of those prisoners.